The filming for Spider-Man: Homecoming continued in New York on Saturday, October 1st, and we’ve got a look at Tom Holland playing both Spidey and Peter Parker in two different scenes that were shot. You can view the Spider-Man and Peter Parker photos in the gallery below! Filming for the Marvel Studios and Sony Pictures movie previously took place in Atlanta, Georgia. Tom Holland reprises the role of Peter Parker/Spider-Man he first played in Captain America: Civil War, and is joined by Marisa Tomei as Aunt May, Robert Downey Jr. as Tony Stark/Iron Man, Jon Favreau as Happy Hogan,, Michael Keaton as the Vulture, Logan Marshall-Green as a secondary villain, Kenneth Choi as Peter’s high school Principal, and Zendaya as a character by the name of Michelle (rumored to be Mary Jane Watson). Directed by Jon Watts, Spider-Man: Homecoming also stars Donald Glover, Martin Starr, Michael Barbieri, Laura Harrier, Tony Revolori, Angourie Rice, Jacob Batalon, Tyne Daly, and Bokeem Woodbine. 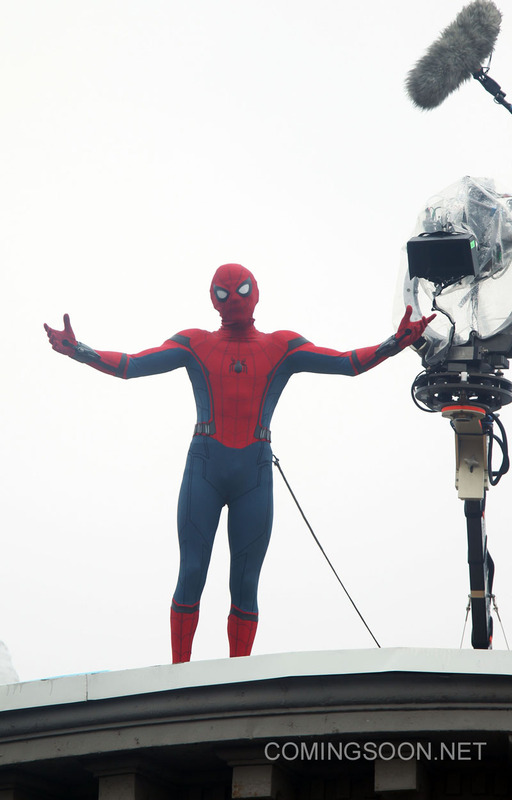 In the film, a young Peter Parker/Spider-Man begins to navigate his newfound identity as the web-slinging superhero.